The chawan was in fashion, out of fashion, and is now back in fashion here in the West (Europe and North America). All over the course of a mere three or four centuries. If you’re thinking of buying one or more, there are some things to consider first. Actually, three things top my list of what to look for when buying that chawan. First, some basic info. 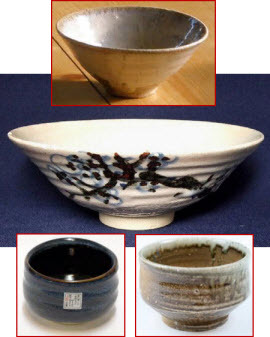 A chawan is a small bowl (no handle) used for sipping tea. When tea first came to Europe such small bowls and handleless sipper cups came with it. Tea being enjoyed mainly by the very rich (due to the high cost and risk of bringing the tea to them), they sought a more genteel (and less finger scorching) way of imbibing that wonderful tea liquid. Ceramists in Europe were able to figure out how to attach a handle that would stay cool and attached to the cup all at once. From that point, the chawans and sipper cups were passed over in favor of these new-fangled cups. Today, though, with teas like matcha and the gongfu style of tea steeping gaining in popularity, the chawan is becoming more popular. Some chawans are too tall and narrow and shaped more like a sipper cup. They need to be shorter and wider. Some are too straight-sided for my taste versus having a more flared out shape. This is not just a matter of appearance but of practicality since the more flared design is better at allowing a slight cooling of the tea liquid so you can enjoy it more fully. Scorching hot tea will burn your tongue and reduce your ability to enjoy its various flavors and aromas. Some of the shape is determined by which tea you will be having in it. A matcha chawan, for example, needs room for that chasen (tea whisk). No handle. So you’re going to be holding your chawan either cupped in your hand (if it’s cool enough or if you have fingers made of asbestos), with a small cloth under it like in chanoyu, or by the rim which is my usual method. One good reason to have a chawan that is large enough for you to pour enough tea for a good bit of sipping and yet have the liquid low enough so that you can hold it by the rim. Let’s face it, tea is a sensory experience. The aroma of the dry tea leaves, no matter what form they are in, draws us in. Then of the steeped liquid where the aroma and flavor are closely linked. And the sight of both dry leaves, liquid, and steeped leaves can add to that experience. The teawares are just as important in these respects, a fact that is evident based solely on the endless designs of teapots, teacups, tea boats, and more, that are available. Chawan glazes centuries ago were often dark in color since the lighter tea liquid was supposed to show best against it. I, however, prefer a white interior so that I can see the true liquid color, part of that sensory experience with tea. And luckily today you can find plenty like that.